One of the biggest takeaways from Ebola showing up in the United States, something that is being completely ignored by most of the media, is the complete breakdown and failure of this country’s emergency preparedness agencies. If you take anything away from this failure, it should be you’re on your own when it comes to protecting yourself from threats. In the United States, we spend billions upon billions of dollars on emergency preparedness every year, with over $6.6 billion going directly to the CDC to combat disease. With so much money being thrown at emergency preparedness, one would think these agencies would have a plan to deal with something like a pandemic outbreak; they don’t! With a single case of Ebola showing up in the U.S., we have witnessed the complete breakdown of the entire federal preparedness system. From DHS and border patrol failing to shutdown air travel during an active epidemic in West Africa, to the CDC’s complete failure to manage a single case of Ebola, no one in government seems to have an actual plan in place to deal with this type of emergency. In fact, day after day the CDC comes out during their daily press conference basically admitting their making it up as they go. In today’s press conference, CDC director Thomas Frieden admitted the CDC’s response to Ebola showing up in Dallas was inadequate – a gross understatement, but a step up from yesterday’s press conference where he actually blamed the infected nurse for catching Ebola. After this admission, why is no one calling for his immediate resignation? Remember this is the same guy who assured the public that every hospital in the United States was equipped to immediately stop Ebola from spreading – something our nation’s nurses have been warning was never the case. This is also the same agency that receives $6.6 billion a year in funding. Why did it take a case of Ebola showing up at a U.S. Hospital for them to take action? Where exactly have these billions of dollars gone, because we can be pretty damn sure they didn’t go towards coming up with a plan of action. Some of the money went to fighting Zombies; I’m not joking; ZOMBIES! This is something we have actually covered over the last couple of years, and something that CDC director Friedman actually admitted to during a segment on NPR in 2012. 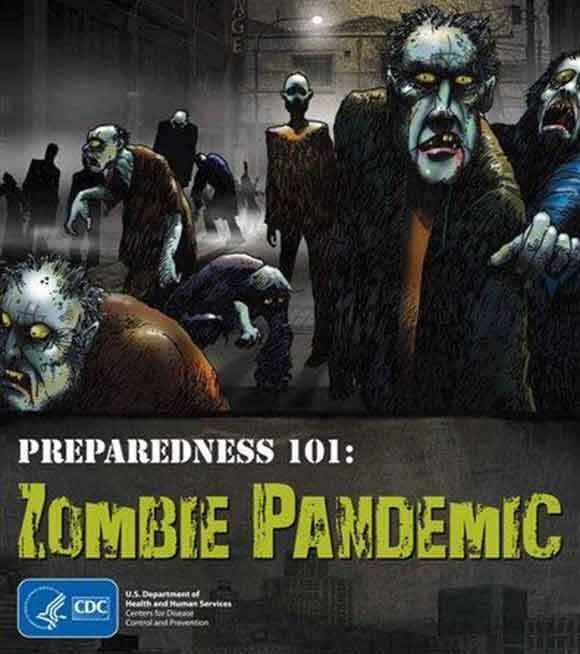 Over the last couple of years the CDC has used part of their budget running Zombie Preparedness Drills. I really wish I was joking about this one, but they’ve actually spent your tax dollars on zombie preparedness drills. But wait it gets even better. They not only spent your money on mock drills, but they actually sunk your tax dollars into creating viral social media campaigns about ZOMBIES. Instead of focusing on real threats like Ebola, MERS, EV-D68, and a myriad of other very real diseases, these idiots choose to focus on zombies. Government bureaucracy at its finest! The link did not work at first. I saw some of the things there. Crazy yes, seemsa bit immature, but most folks don’t have a clue about prepared. But they know movies and zombies. That, they could relate to! I don’t really see how that will work do get people really thinking about it. I can see more confusion tho. Thanx for the article. Out tax dollars hard at work. It gets worse by the day. I am really starting to get worried. I have my GOD bags packed but in this case it looks like we may have to homestead if TSHTF. I am not a nut just an average person who thinks that things just might get out of control pretty quick. I do not trust the Govenment to tell the trut h or have the necessary supplie, training, or plans to deal with what may be coming down t he pike. I want to prepare but I do not want to go overboard and spend money on items I won’t use. I am seriously thinking about expanding my food stocks at a minimum. What are others really doing. I don’t want t o hear from the end of the world crowd just smart, proactive people. Falcon51 – Hear that! Been at this since 2006/07 once I woke-up out of my mind control via people in my life and alternative radio. Let’s see a older man I used to work with for 7 years is a tried and true Obamanite. He tried to to send me an article about how Ebola is the Republicans fault. Now I do hear them calling it on the letter news on the BOOBTUBE. Well, geez we have a DemoRAT controlled Congress and Obama and his shysters only concern is NOT balancing a Budget YET and printing Faux money “out of thin air” I see all our $ as Monopoly $ – worthless. Yet, here’s an article that after receiving the $ for “Preventive measures”. Now why in the World would the Demorats WANT to dole out $ when they can kill as many off as possible. See, I have listened in depth and Heard from a Dr. G. (last name ?) 2 weeks ago when Duncan was still alive he had called into a certain radio station and this was the Dr. dude that had 1st hand knowledge of this Ebola thing over 2 mos. ago and went to the CDC screaming to close the damn borders! That this Ebola thing was imminent Threat if Precautions were not taken immediately. So, when was it that Obama ordered the borders OPEN? HUH? about 2 mos. ago right? They will funnel the $ whereever Obama wants it to go. Muslim Jihadists? Isis? Who, where? Not for Ebola Prev. measures here that’s for damn sure. Hey Falcon you have a boat? No boat. Best option is to shelter in place for me if tshtf . I want to complete my preparedness now so I don’t get caught in a jam. We have about two-three weeks worth of supplies but may need more. I have a real bad feeling about this. I don’t think the grid will collapse or zombie time will occur. I just think things are really going to get bad quick. Are you stupid for a living? Amazing how people can get rich by making up garbage BS. Taxpayers have been charged over $1Billion a year to the CDC for pandemic outbreaks of diseases like HIV/AIDS for a decade now. It’s even more sickening that morons like you can write your filthy puke and post in on the internet to amuse your moronic friends and family.